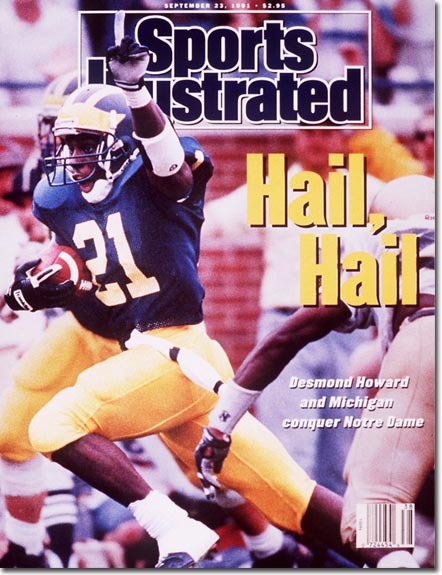 The man you see gracing the banner of this site and the September 1991 issue of SI above, Desmond Howard, was elected into the College Football Hall of Fame. Howard is 1 of 14 inductees named today for the 2010 class. Nowadays you can now see Desmond on ESPN's College Gameday broadcasts during the season. Of course Howard is most recognized for his Heisman Trophy win in 1991 (and the famous pose he struck after returning a punt for a touchdown against the Buckeyes that year in which Keith Jackson proclaimed on the broadcast "Helloooo Heisman! "), but he was also a consensus All-American, recipient of the Maxwell Award, winner of the 1991 Walter Camp player of the year. In addition to those accolades, he also became the first receiver to ever lead the Big Ten in scoring. He set or tied 5 NCAA records, and 12 Michigan single-season records during his senior year. Amazingly, he still holds the Michigan record for most TDs in one season with 23 and most points scored (138). He also still holds the Big Ten single-season record for most receiving TDs in one year with 19 in 1991. He also has a Super Bowl ring, as a member of the Super Bowl XXXI Champion Green Bay Packers, in which he became the first ever special teams player to be named Super Bowl MVP. Desmond retired from the NFL in 2002 after spending 11 seasons in the league.